Eddie grew up within a family to whom the music of his local brass band featured highly. He was soon able to play a variety of instruments though he was most accomplished on the trumpet. After the war, he graduated from playing as an amateur in brass bands to professional engagements with popular dance orchestras of the day including that of Geraldo, and he soon became renowned for the virtuosity of his performances. Following his exposure on TV with the Stanley Black orchestra, an enthusiastic announcer introduced him as the 'Man With The Golden Trumpet' - an apt description that remained with him for the remainder of his musical career. Eddie's style was unusually individualistic and he became a familiar musician on BBC radio and TV during the 1950s. His popularity can be assessed from the success of his records which included two number ones, 'Oh Mein Papa' followed more than a year later by 'Cherry Pink And Apple Blossom White'. The magnificent 'Oh Mein Papa', which also sold well in the USA, topped the UK chart for no less than nine weeks and was successful enough to provide him with the first ever 'gold disc' awarded for an instrumental. Further chart entries were secured with 'John And Julie' taken from the soundtrack of the movie and 'Mandy'- Eddie's last major hit. As the music scene entered the less innocent age of the 1960s, Eddie's beautiful musical renditions became less appreciated by record buyers. By 1968 Eddie had become a little disillusioned by his dwindling fortunes and left Britain making South Africa his home. Sadly, in 1978 aged only 56, Eddie passed away and the golden trumpet was silenced. 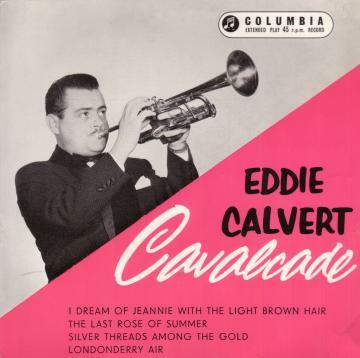 Eddie Calvert was at his peak of success at a time when EPs were also popular. Despite the fact that they must have sold reasonably well, all Eddie's EPs seem to have become quite difficult to find. The EP illustrated here was published during 1958 and has Eddie playing some well known ballads rather than his most famous hits which had been a few years earlier. The record finds him in the company of Norrie Paramor and his Orchestra- the resident musicians for Columbia. Columbia DB4393 1960 Jealousy/ Malta G.C. SEG7591 1955 "Golden Melodies Of A Golden Trumpet"
SEG7627 1956 "Golden Trumpet, Golden Memories"
SEG7637 1956 "Golden Melodies Of A Golden Trumpet No.2"
SEG7710 1957 "Oh! My Papa!" SEG7731 1957 "Trumpet Serenade No.2"
SEG7802 1957 "The Man With The Golden Trumpet"
SEG7853 1959 "Eddie Plays Italy"
SEG7891 1960 "Eddie Calvert's Gay Melodies"
SEG7994 (ESG7780) 1960 "My Horn Goes Round The World"